Some of the easiest and most interesting dives are pier, pool enclosures or bridge dives. Swansea Bridge and Merimbula Wharf in NSW, Rapid Bay Jetty in South Australia and Busselton Jetty in Western Australia are just a few of the fantastic dives that are so easy to do. In the Melbourne area, there are a few of piers/wharves that are regularly dived. One of these is Portsea Pier. While this is not actually in Melbourne, it is a dive that is considered to be in the general Melbourne area. Portsea is located just under a 100 kilometres by road south of the City centre. It is about a 90 minute drive from the City. See the Melbourne Page for more information. As you arrive in the small township (suburb?) of Portsea, you will notice that the Portsea Hotel is on the right as you come down the slight hill and some shops on both sides of the road. The Portsea Pier is located on your right past the hotel at the bottom of the hill in the main shopping centre. There is a very small parking area in front of this area but it is time restricted to (I think) one hour. Across the road is another larger parking area and to the west of this another large parking area. All these parking areas have a time parking limit during the Spring to Autumn period. I think that from October to April the maximum time in the larger area is two hours and one hour in the smaller areas and on the road. At other times of the year there does not appear to be a limit in the parking areas. Make sure you are careful when you park here, especially in the Spring to Autumn period. There are three dive shops in Portsea. One is located between the pier and the pub, the other two on the other side of the road behind the slip road. On the corner of the slip road and the third parking area mentioned above is Melbourne Diving Services. This is a huge dive shop, far bigger than any shop in Sydney and probably larger than anything in New South Wales. Behind the shop is a laneway that leads to yet another parking area. This one is less formal than the others and is further away from the dive site, but it has one big advantage, it has no time limit and is used by divers who are doing boat dives and multiple dives in a day. If you are only doing one dive here, it would be safe to park in either of the larger car parking areas. It is not too long a walk out to the start of the dive site, but many people seem to have modified trolleys to carry their tank and weights out to the pier (they chain them to the pier's railing). 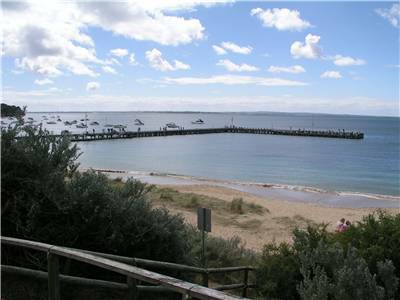 Portsea Pier is about 125 metres long and has a right-angle extension (to the right) of about another 80 metres. It is built from timber and the right side is used by the numerous charter boats to pick up and drop off their clients. The first section of the pier is across the sand (for say 15 metres) and then the water starts. On the three days I have been at the pier many divers seem to walk about threequarters of the way out the main arm of the pier before entering the water. I have no idea why you would walk this far, as the leap into the water is from a great altitude, higher than The Leap in Sydney and about the same as Rapid Bay Jetty. A better bet is to enter the water off the beach or easier still, use the low section of wharf on the right near the start (where most charter boats tie up) and drop the short distance into the water. As an aside, why do so many dive instructors make students enter the water from very hard locations rather than the easy spot? It happens in Sydney too. I have seen instructors making divers doing their Open Water course to jump in at Bare Island where there are waves breaking while the other side of the island has millpond seas. No wonder many new divers give up when they may have had a bad experience entering or exiting the water. Anyway, after donning your mask and fins, it is an easy stride into the water from this spot. Once on the bottom you will see that it is just over two metres deep. Follow the right side of the pier out to the end. This is the eastern side of the main section of the pier. As you go, look at all the piles and also scan the sea floor. The bottom is sand with lots of "rubbish" all over the place. This "rubbish" is old pieces of timber from the wharf, bottles, cans, rocks and other junk (metal, tyres). This has great sealife on it. Keep an eye out for boats so that you do not get too close to them if they start their engines. Likewise, do not explore too far away from the pier on this side. There are lots of small crabs to be seen and I assume that on night dives you may also see things like sea spiders and decorator crabs. 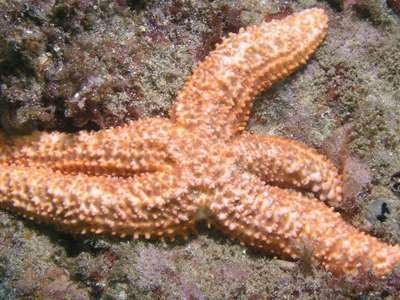 There are lots of small creatures to see, pygmy leatherjackets, many species of starfish and nudibranches, small clams and other interesting things. I have been told that you can see sea dragons here but I did not see any. I would think that sea horses many also be living here but I am not sure. Make sure that you examine all the rubbish (tyres have lots of hiding places) and in the small kelp. When you reach the spot where the pier turns to the right, follow the same side. This is the southern side of the end section. At the end, turn around and come back along the right side (as you are swimming). This is the opposite side of the pier to what you have already done and is the northern side of the end section. The maximum depth out around here is almost five metres. Return to the shore along the northern side and then when you turn to the left, the western side of the pier. The depth will gradually get shallower and eventually it will be too shallow to continue and you will need to stand and walk out. This is a nice dive and well worth doing. I think it would be an even better night dive, I probably should have tried it out when I was visiting. Visibility here on my dive was about 10 metres and the water temperature in February about 19°C. Due to the shallow depth, you may need to have a little more weight than on a normal dive.